A Jack with a lightning bolt. Coming up from behind to surprise his victim with a shock. 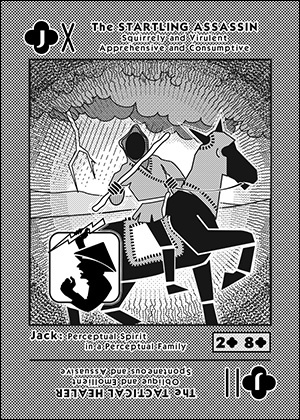 A Perceptual Spirit in a Perceptual Family. Startling, because, like the 2 of [--] he is indirect and pops up unexpectedly. Assassin, because, like the 8 of [--] he will drain your energy. Desultory, because, like the 2 of [--] he is meandering and lost. Virulent, because, like the 8 of [--] he is a disease that will consume you.